Phytocultures has developed and simplified the technology of in vitro plant propagation to make the procedure accessible to both commercial growers and home gardeners. The patented equipment supplied by Phytocultures has been developed for ruggedness, adaptability and flexibility, and is backed by 20 years of direct application. The basic in vitro technology is easily learned and adaptable so you can scale your operation to your anticipated needs. Phytocultures’ 20 years of experience assures that appropriate methods are employed to maintain phytosanitary health and minimize overhead costs. Our knowledge and technical advice enables our client to successfully develop and produce plantlets in their own tissue culture operation. A range of in vitro equipment is available and the extent of complexity of your purchases will depend on the specific objectives of your work. The techniques and equipment are easy to use and operators and staff can become proficient in a short period of time. 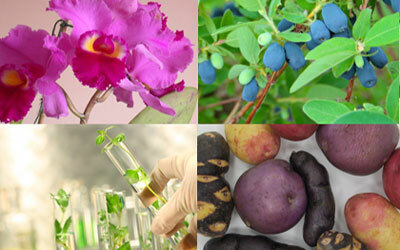 Phytocultures has a germplasm bank with many varieties of potatoes, blueberries, cranberries, sweet potatoes, strawberries, orchids and other ornamental plants.